OVER the past several years Egypt has seen two popular revolutions, the removal of two presidents from office, the turn-over of six governments, and a failed experiment in political Islam. From the spasms of this constant state of flux, it is undeniable that we are witnessing the emergence of a new Egypt in a new Middle East. This continuing transition poses dramatic challenges and considerations for policy-makers and administrators, whilst adding complexity to an ever more intricate paradigm, as Egypt seeks to secure a better future. The socio-economic landscape includes the fact that today’s Egypt has a population of close to 90 million—a figure expected to exceed 100 million by 2030. This demographic situation presents profound economic challenges. Some 750,000 people join Egypt’s labor force annually; our current national unemployment rate is 13 percent, with youth unemployment estimated between 25 and 30 percent. In order to absorb these new labor market entrants, Egypt will need to maintain an annual growth rate of eight to nine percent—and reducing unemployment to below 10 percent will require our economy to grow continuously at eight percent per year for the next decade. Daunting as this situation might be, these challenges are further exacerbated when we consider Egypt’s future resource requirements. As a net importer of food, water, capital, and energy, a rapidly-growing Egypt will face a widening gap between demand for resources and domestic supply, forcing it to look abroad even more than it does at present. The evidence points to the indisputable fact that Egypt needs domestic economic reforms-to increase efficiency and streamline energy consumption-in order to reduce its external resource dependence. Yet enacting such reforms will necessarily be met with difficulty, due to dire economic circumstances. In the present atmosphere—still resonant with revolutionary fervor—taking difficult policy decisions requires political consensus. In the short-and intermediate-term, Egypt will have to make long-postponed, tough, and courageous decisions to take on its problems and seize the opportunities on offer. I am nevertheless confident that, with an energized society, Egypt will become endowed with the ability to rise to the challenge of creating a better future—one driven increasingly by the absolute imperative of sustained economic growth, increased resource, and demographic, pressures; and that all of this will take place against the backdrop of rising demand for greater pluralism and political openness-propelled by demographic and social change. Egyptians will make sacrifices if their expectations for transparency and accountability are met, and the fruits of reform are distributed more equitably. Given the events of the last few years, it is worth emphasizing that economic growth and political openness must march hand in hand with the synergies between them, thus creating a greater catalyst for progress. An energized society is more difficult to satisfy and govern. It is, however, a much better challenge than engaging an apathetic constituency that felt marginalized and was unmanageable and unproductive. It is in this domestic context that one must examine Egypt’s foreign policy. As the country seeks to realize the aspirations of its revolutions, the trajectory of its foreign policy will be critical in creating a better future. Indeed, if I were asked what would be the overriding strategic domestic objective for Egypt’s future foreign policy, I would venture to reply that it is to provide an enabling environment for the attainment of Egypt’s economic needs and political priorities. However, this is not to say that Egypt’s foreign policy will pursue solely domestic economic goals, or be driven solely by material needs. 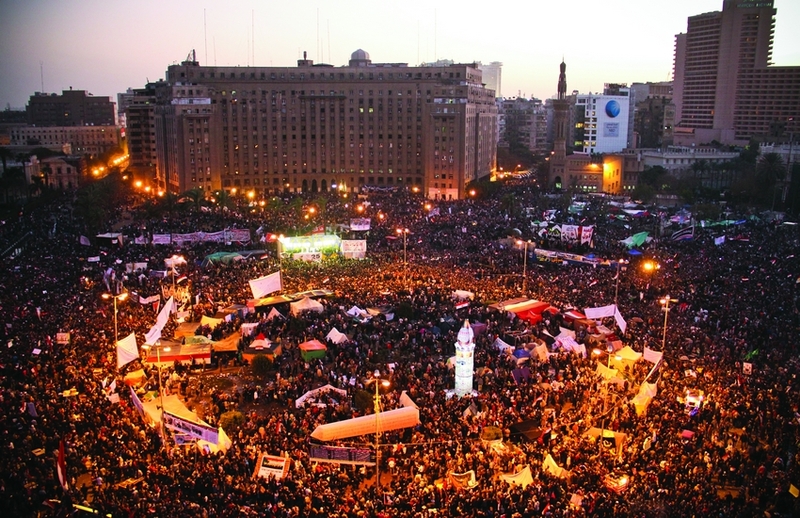 In fact, the aspirations expressed through Egypt’s revolutions demand an activist foreign policy, which seeks not only to regain and strengthen, but also improve upon, its historic leadership role and international standing. And it is through this process of rejuvenation and assertiveness of active, but astute, leadership that Egypt can project the need and create the incentive for exponential value to attract investors in economic growth and rapid social stability. Most importantly, Egypt will need to shape its regional environment to allow its democracy to mature free from the scourge of extremism and the menacing sectarianism which threaten the regional fabric; the danger of terrorism; and the chronic instability that stems from the Middle East’s perennial conflicts. A revitalization of Egypt’s trade diplomacy will be a top priority to forge economic partnerships, secure new markets, and sustain Egypt’s future economic growth. Here it must also be noted that food, energy, and water security will increasingly dominate Egypt’s foreign policy agenda-in a context in which resource politics are becoming increasingly globalized. In examining how Egypt’s new realities will propel its future foreign policy, it is also necessary to acknowledge the profound transformations occurring on both global and regional levels that pose specific challenges and opportunities. Globally, there are two major shifts: a perceived horizontal shift from the diplomatic and economic primacy of the Euro-Atlantic region to an increased focus on Asia and the Pacific; and a vertical shift, from the nation-state to an array of non-state actors. These changes are neither simple nor absolute: an end to the post-Cold War unipolar order does not detract from the present geopolitical significance of the United States and other Western industrialized states; rather, it points to a more pluralistic global order in which other powers increasingly assert their interests. Similarly, the rise of non-state actors does not mean that nation states will no longer be the central figures of international relations; yet they will need to compete with the growing power of non-state actors and global entities. I also see a trend in global governance away from formalized intergovern-mental institutions in the traditional UN framework, and towards a larger role for a growing number of informal, and/or issue-specific organizations, such as the Internet Corporation for Assigned Names and Numbers (ICANN) and the International Telecommunications Union (ITU). Finally, we must also consider the demographic transformation of Asia: by 2030, Asia will be home to 64 percent of the global middle class, as well as containing 40 percent of global middle-class consumption. The implications of this spike in global demand for resources are profound and far-reaching. Amidst such expansion, securing access to energy, food, water, and raw materials will be increasingly viewed as national security issues. Formidable as they are, these are not Egypt’s only challenges. As the cumulative effects of the Arab revolutions, regional conflicts, and weak governance in the Arab World continue to take a toll on the cohesion of nation states, politics in the Middle East are becoming progressively sectarianized. More and more, political identities are being defined in ethnic, religious, and even tribal terms. It is also noteworthy that regional conflicts are increasingly falsely understood-defined simply in the same terms as Sunni versus Shia, or Kurd or Persian against Arab, in the mold of the Arab-Israeli conflict. These parameters are not mutually exclusive, thus making their resolution even more complicated. While conflicts between states are susceptible to negotiated solutions, conflicts based on primordial identity defy compromise and become increasingly intractable. Simultaneously, the preponderance of weak state structures regionally has led to a trend of fragmentation, especially in the case of Egypt’s immediate neighbors. Libya is the starkest example, although Yemen has become increasingly problematic. As with many of the Arab Spring countries, Yemen’s calls for freedom and democracy brought a range of domestic, regional, and international forces into play—and it is undeniable that the contradicting perspectives of Yemeni political powers and the Arab Gulf countries, as well as Iran, have played a significant role in the deterioration of the Yemeni state. This fragmentation has facilitated the rise of trans-national threats, such as violent extremism and smuggling, which often emerge in the ungoverned spaces of weak or collapsing state structures. The deteriorating situation in these countries belies the importance of legitimate institutions; as their absence facilitates violent friction between opposed groups. Terrorism in particular has proven to be an increasingly severe regional threat. As jihadist elements have been driven from Central Asia, many of them have relocated to various conflict zones in our region, coalescing in Syria, Iraq, North Africa, the Sahel, and Somalia. Most critically, but not exclusively, the emergence of ISIS—first in Iraq and Syria and then in Libya—has both absorbed displaced jihadis from other conflicts and exploited the failed state structures in the countries in which they operate-seizing a staggering amount of territory amidst terrible crimes against humanity. The group’s increasing prominence has also evoked support and affiliation from jihadi groups around the region—much as Al-Qaeda became less of an organization per se and more of a brand under which to organize, ISIS can now claim far-flung satellite groups as its own. This nebulizing quality may prove to be the greatest challenge ISIS poses to the region. Egyptian Christians in Libya has brought a swift response-with Egyptian forces conducting airstrikes against ISIS-affiliated groups on their western neighbor’s soil. These atrocities, and those committed against Western and Asian victims, serve as a call for global action. Another alarming trend is ongoing regional militarization. While this predates the Arab revolutions, it has recently been intensified by the parallel movement towards nuclearization as a result of the region’s failure to adequately rise to the challenge of nonproliferation. Continuing dialogue with Iran regarding its nuclear ambitions may yield a resolution and an end to the country’s diplomatic isolation, including by almost all the Arab states. Hopefully, this would empower Iran to engage in regional conflict management and good neighborly relations. However, a nuclear deal may also make Iran overconfident, driving it to pursue an aggressive regional foreign policy. This debate continues within the Iranian body politic. Finally, the region will confront the aforementioned challenges while dealing with its own resource crisis-which could generate even further regional conflict. By 2050, the Middle East’s water resources will have dropped by more than half. And despite the region’s substantial share of hydrocarbon resources, it is projected to become more vulnerable to energy security risks—given that regional economies are, on average, 60 percent more energy-intensive than the economies of the OECD. The transformations that pose these challenges also offer impressive opportunities. In order to fully capitalize on them, the Arab world needs strong and wise leadership. No country is better suited today to assume this role than Egypt. To succeed, however, Egypt needs to undertake a fundamental reassessment of its foreign policy, combining elements of both continuity and change. The ongoing global rebalancing of power will afford Egypt the opportunity to diversify its portfolio of strategic and economic relationships. Four days after my appointment as Foreign Minister in July 2013, I called a press conference to publicly lay out our goals, parameters, and initiatives. I emphasized that Egypt will continue to maintain-and indeed enhance-its strategic partnerships with the United States and Europe. But I also emphasized that we would look elsewhere as well. Hence, steps were subsequently taken to nurture our emerging strategic relationships with both Russia and China—not only for our respective mutual benefit, but also to serve regional peace and security. President Abdel Fattah el-Sisi’s visits to Moscow and Beijing, as well as Russian President Vladimir Putin’s recent visit to Cairo, demonstrate the importance of these relationships, which have resulted in major achievements in trade, tourism, and international monetary policy. Equally, if not more importantly, I underscored at my inaugural press conference that Egypt would reset its political center of gravity and priorities to more clearly reflect both its Arab origins and African roots. Foreign policy starts at home. 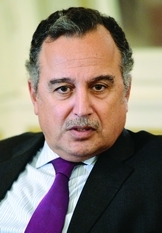 Similarly, the changes underway in the regimes and frameworks of international institutions will require Egypt to become increasingly integrated into various emerging global networks that will assume central roles in addressing the challenges of global governance, alongside the formal institutions embodied in the United Nations. This must also be accompanied by an effort to revitalize international groupings of which Egypt is a member—such as the G-15—or devise new groupings reflective of the interests of emerging markets. The March 2015 Sharm el Sheikh Economic Summit convened by Egypt is testimony to this commitment. As Egypt embarks on the task of rebuilding the country’s economy, Cairo will increasingly look east. The dynamic economies of Asia provide opportunities for Egypt in the fields of technology transfer, investment, integration into global production chains, and export markets. The healthy bilate-ral partnerships we have with India, South Korea, and Japan exemplify this trend; and it is in our mutual interest to encourage further development of bilateral trade, investment, and cooperation with the region. In addition to looking east, Egypt will also be seriously looking south, working to restore its atrophied relations with African states as an integral part of the continent’s future—especially in development terms—commensurate with Egypt’s pioneering support for African liberation movements in previous decades. Egypt’s reintegration into the African fold should reinstate its historic role as a leader in addressing the continent’s manifold challenges, in realms such as peace and security, conflict resolution, development assistance, and technical expertise. Egypt’s immediate neighborhood—Libya, the Sudan, and, by extension, the Sahel—will always top our foreign policy priorities. In all of this, Egypt cannot afford to turn away from the historic conflicts of the Middle East. The issues of Gulf security, Lebanon, regional non-proliferation, and disarmament have again become the focus of Egypt’s diplomacy. To these challenges we must now add the civil war in Syria, the implications of the Kurdish issue, the rise of ISIS, the instability in Libya and Yemen, and the overarching Sunni-Shia divide. All of these are inextricably linked to Egypt’s national security. stability. Recent events in Gaza and Jerusalem are cases in point. That the peace process has now reached an impasse should not be a source of surprise or discouragement. The stakes involved leave us little choice but to redouble our efforts and try again. Egypt stands ready to partner with the international community in this endeavor-for comprehensive Arab-Israeli peace has been, and remains, a cornerstone of our foreign policy. Egypt was the first Arab country to extend its hand for peace—an opportunity seized upon by the United States to forge the historic peace treaty between Egypt and Israel. And many forget that every major Israeli-Palestinian agreement was undertaken in the context of a close diplomatic partnership between Washington and Cairo. In navigating this complex regional landscape, Egypt will seek to reclaim its influencing role not only as an arbiter of the region’s conflicts and multiple security challenges. Egypt will also seek to do so as the intellectual beacon of the Arab world and the whole region-for it is uniquely placed to assume responsibility to confront conflicts that are increasingly assuming sectarian and religious overtones. Beyond this, it falls to Egypt—heir to a long and proud history of leadership—to articulate a new vision for the Arab world itself. That vision should entail establishing a strong regional compact of the Arab nations to address our common challenges. In this role, Egypt—the traditional beacon of Arab society with its many dimensions—carries on its shoulders the responsibility of defining the future of the Arab world.This future must be better defined by Arabs, grounded in the rules and norms of the international community, and buoyed by its support. In doing so, Egypt should devise its regional diplomacy neither on the basis of narrow sectarian interests, nor on the politicization of religion. Rather, it must seek to project its role in the Arab world based on a political model that establishes and offers others the opportunity to voluntarily emulate. • Sovereign states that will not be deterred in pursuing their self-defense and national security, whilst advancing collective security on a regional basis and resolving disputes by peaceful means. Egypt should not stand in opposition to those who adopt a different form of governance or ideology. However, Cairo must stand firm against those who seek to undermine Egypt’s cohesiveness in diversity, challenge its sovereignty, or question its identity. Egypt’s foreign relations should have concrete short- and medium-term objectives within the framework of a strategic vision for the country, and also the regions with which it is associated. At all times, our policies should be guided by long-term national interests of a nation state that is internationalist in conviction. Given the breadth and depth of the challenges Egypt now faces—especially given the Middle East’s current tumult—it will take time to build the stability and prosperity we seek to establish. Yet there are certain promising indicators within Egypt and throughout the region. One cannot discount the significance of the massive voter turnout and civic engagement that has been so evident since the Arab Spring, especially in Tunisia. Such levels of participation will be instrumental in preserving the gains of the revolutions. The most important factor in the success of Tunisia seems to be the emancipation of a large and educated middle class sufficiently informed and capable of participating in the political process. In light of this consideration, it seems all the more pressing for Egypt to work on addressing an array of domestic social issues: it must confront the demons of poverty and unemployment aggressively through job creation, as well as making improvements to health and human services. This will only be possible through wise reforms to the educational system, in order to ensure that the country prepares young Egyptians for a twenty-first-century global economy- taking special care to strategically harmonize the needs of employers with national curricula and training programs. While there are major material gains that Egypt can realize by undertaking effective reforms in education and the economy, these issues are also of paramount importance in protecting Egyptian society itself, solidifying a cohesive community ethos and resisting the predations of extremist thinking. Educational achievement and upward economic mobility will give Egyptians faith and franchise in the country’s policy agenda-diminishing the appeal as well as the threat of radicalism. At the same time, providing jobs to a new generation of educated Egyptians will require the country to marshal a great quantity of investment capital, as well as ensuring economic stability and secure investor confidence. On these economic fronts, Egypt is making key advances: the last quarter of 2014 saw strong GDP growth, as well as higher than projected growth in investment. Moreover, recent figures show major commitments to develop Egypt’s important small and medium enterprises. The country is also making important investments directly—including improvements to its power and gas infrastructure. The March 2015 Economic Summit at Sharm el-Sheikh generated a serious collaborative effort between governments and investment capital-while the tremendous wealth of the Arab Gulf states offers a further promise of continuing productive investment. As a recent IMF report details-notwithstanding marked improvements to the country’s macroeconomic stability and its reform environment-the greatest threats to Egyptian economic progress remain regional and domestic security risks. It is clear, then, that the diverse goals of Egypt in the present era—security, political stability, and economic progress—are intricately linked; progress in one area will require a concerted effort on all three fronts. The new Egypt that the world hopes to see is one which can rise to meet the tremendous challenges it faces on the basis of the rule of law and equality of citizenship, whilst engaging the world with a forward-looking vision for Egypt and the region. These understandings undergird the direction of Egypt’s regional and global diplomacy, and will continue to guide its policies as we move through the continuing transformation of our nation towards a brighter future.